You call that counterfeiting? This is counterfeiting! An aggressive note demonetization in the face of large-scale counterfeiting is a thoroughly justified response as it immediately puts a halt to the problem. 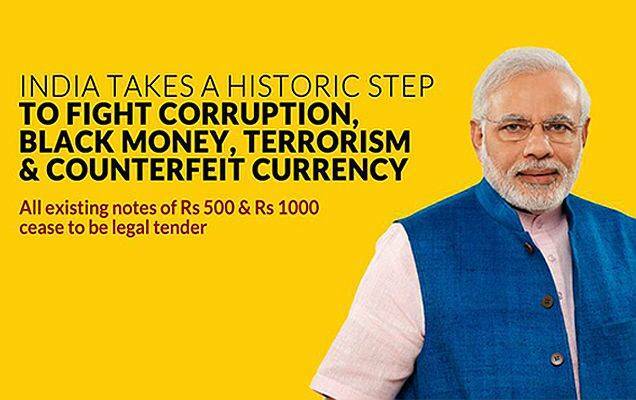 In this context, it's worth revisiting the world's most recent attempt to combat counterfeiting with an aggressive demonetization—India PM Narendra Modi's forced recall of the Rs1000 and 500 notes on November 9, 2016, some 290 days ago. How does it compare to Portugal in 1925? Terrorism is a frightening threat. So many have lost their lives because of it. But have you ever thought about how these terrorists get their money? Enemies from across the border run their operations using fake currency notes. This has been going on for years. Many times, those using fake 500 and 1,000 rupee notes have been caught and many such notes have been seized. Translating Rs11.23 crore into dollar terms, the monetary authorities have found just US$1.7 million worth of counterfeit notes. Step back for a moment and compare $1.7 million to the full breadth and width of the demonetization. In declaring that all Rs1000 and 500 notes were to be useless, Modi demonetized US$240 billion worth of paper rupees, around 85% of India's stock of banknotes. So only 0.001% of the entire face value that has been brought in for conversion was fake! That's an incredibly low value of counterfeits, especially when you consider that in 1925, Reis's counterfeits accounted for around 5% of the entire Portuguese paper money supply. Central bankers usually measure counterfeiting in parts per million, or PPM, the number of fakes detected in one year for every one million genuine notes in circulation. I've inserted a chart below, which comes from this Reserve Bank of Australia document. Canada, for instance, once had a much higher PPM (it even hit 450 back in 2004), but the Bank of Canada managed to bring this down to the low double digits by introducing new security features and, later, polymer notes. Australia, the first nation to introduce polymer notes in the early 1990s, used to boast one of the lowest incidences of counterfeiting (below 5 PPM). Criminals are finally starting to make polymer fakes, perhaps because the RBA hasn't bothered to update the series for over two decades, giving plenty of time for counterfeiters to catch up. In India's case, the recent numbers show a total of 158,000 fake notes detected (out of a 24 billion banknotes demonetized) between November 8, 2016 and July 14, 2017, this totaling up to a minuscule 6.6 PPM—in the same range of countries like Canada or Australia. And certainly not in the same category as Portugal in 1925. Nor is this data anomalous. Back in January, James Wilson—an Indian civil engineer-turned-demonetization expert—perused official banknote statistics only to find that over the last few years India has not had a high incidence of counterfeit rupees, leading him to describe the demonetization effort as a cannon shooting at sparrows. Using some of the data from James' post, it's possible to calculate that India had a PPM of 7.1 in 2015/16. (I get this from 90.266 billion units of currency in circulation, and 632,926 counterfeits detected that year). This is consistent with earlier data from the Reserve Bank of India showing a PPM from 2007-2012 ranging between 4.4 to 8.1. So India's rate of counterfeits detected is fairly reasonable relative to other countries. This low PPM could be due to two factors. Either India doesn't have a counterfeiting problem, or it does have one but the authorities are just really bad at detecting counterfeits. If neither Indian banks nor its central bank are particularly good at identifying fake notes, then a large stock of unidentified fakes may be permanently circulating along with legitimate banknotes with no one capable of draining out the fakes. But even so, why instigate a massive note recall to catch counterfeits if the institutions that do the catching are so leaky to start with? If it is the case that India has a counterfeiting problem, then Modi's go-to fixes should have been to improve note security features and the banking system's ability to detect fakes, not implement a massive Portuguese-style recall. So the data certainly destroys one of the pillars on which Modi's demonetization was based; terrorism and fake currency. You need something like a Portugal in 1925 to justify an aggressive demonetization, and India wasn't even close. Over the next few months more data will pour in, expect Modi's scheme to be further tested. The recent bitcoin chain split got me thinking again about bitcoin-as-money, specifically as a unit of account. If bitcoin were to serve as a major pricing unit for commerce on the internet, we'd have to get used to some very strange macroeconomic effects every time a chain split occurred. In this post I investigate what this would look like. While true believers claim that bitcoin's destiny is to replace the U.S. dollar, bitcoin has a long way to go. For one, it hasn't yet become a generally-accepted medium of exchange. People who own it are too afraid to spend it lest they miss out on the next boom in its price, and would-be recipients are too shy to accept it given its incredible volatility. So usage of bitcoin has been confined to a very narrow range of transactions. But let's say that down the road bitcoin does become a generally-accepted medium of exchange. The next stage to becoming a full fledged currency like the U.S. dollar involves becoming a unit of account—and here things get down right odd. A unit of account is the sign, or unit, used to express prices. When merchants set prices in a given unit of account, they tend to keep these prices sticky for a while. A few of the world's major units of account include the $, £, €, and ¥. 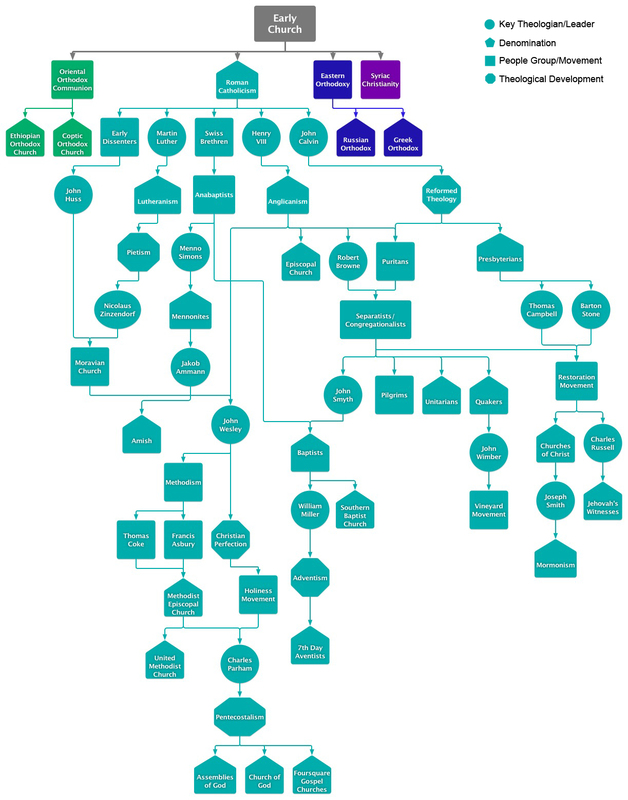 These units of account are conventional ones because there is an underlying physical or digital token that represents them. The $, for instance, is twinned with a set of paper banknotes issued by the Federal Reserve, while ¥ is defined by the Bank of Japan's paper media. Unconventional units of account do not have underlying tokens, but I'll get to these later. So let's go ahead and imagine that bitcoin had succeeded in becoming the unit of account on the internet. The most commonly heard complaint of bitcoin-as-unit of account—a bitcoin standard so to say—is that it would be inflexible, more so than even the gold standard. It would certainly be more volatile, since the supply of bitcoin—unlike gold—can't be increased in response to prices. And those are fair criticisms. But there's a less-talked about drawback of a bitcoin standard: when a chain split occurs, all sorts of confusing things begin to happen that wouldn't occur in a conventional monetary system. For those not following the cryptocurrency market, a chain split is when a new cryptocurrency is created by piggy-backing off an existing cryptocurrency's record of transactions, or blockchain, thus creating two blockchains. Luckily for us, a bitcoin chain split occurred earlier this month and provides us with some grist for our analytical mill. On August 1, 2017 anyone who owned some bitcoins suddenly found that not only did they own the same quantity of bitcoins as they did on July 31, but they had been gifted an equal number of "bonus" tokens called Bitcoin Cash, henceforth BCH. Both cryptocurrencies share the same transaction history up till July 31, but all subsequent blocks of transaction added since then have been unique to each chain. Here's the problem with chain splits. Say that you are a retailer who sells Toyotas using bitcoin, or BTC, as your unit of account. You set your price at 10 BTC. And then a chain split occurs. Now everyone who comes into your shop holds not only x BTC but also x units of Bitcoin Cash. How will your set your prices post-split? The most interesting thing here is that an old bitcoin is not the same thing as a new bitcoin. Old bitcoins contained the entire value of Bitcoin Cash in them. After all, the August 1st chain split was telegraphed many months ahead—so everyone who held a few bitcoins knew well in advance that they would be getting a bonus of Bitcoin Cash. Because a pre-split price for the soon-to-be tokens of $300ish had been established in a futures market, people even knew the approximate value of that bonus. This anticipated value would have been "baked into" the current price of bitcoins, as Jian Li explain here. Then, once the split had occurred and Bitcoin Cash had officially diverged from the parent Bitcoin chain, the price of bitcoins would have fallen since they no longer contained an implicit right to get new Bitcoin Cash tokens. As a Toyota salesperson, you'd want to preserve your margins throughout the entire splitting process. In the post-split world, if you continue to accept 10 BTC per Toyota you'll actually be making less than before. After all, if one BTC is worth ten BCH in the market, then a post-split bitcoin—which is no longer impregnated with a unit of BCH—is worth just nine-tenths of a pre-split bitcoin. In real terms, your income is 10% less than what is was pre-split. You have two options for maintaining your relative position. Option A is to continue to price in current BTC, but jack up your sticker price by 10% to 11 BTC. Customers will now owe you more bitcoins per Toyota, but this only counterbalances the fact that the bitcoins you're getting no longer have valuable BCH baked into them. This would make for quite an odd monetary system relative to the one we have now. If everyone does the same thing that you do—mark up their sticker prices the moment a split occurs—the economy-wide consumer price level will experience a one-time shot of inflation. Given that bitcoin schisms will probably occur every few years or so, the long-term price level would be characterized by a series of sudden price bursts, the size depending on how valuable the new token is. When splits are extremely contentious, and the new token is worth just a shade less than the existing bitcoin token, the price level will have to double overnight. That's quite an adjustment! The closest we get to chain splits in the real world are when the monetary authorities decide to undergo note redenominations. Central bankers in economies experiencing high inflation will sometimes call in—say—all $1,000,000 banknotes and replace them with $10 banknotes. And to compensate for this lopping-off of zeroes, merchants will chop price by 99.999% overnight. But redenominations are very rare, especially in developed countries. Up until it dollarized in 2008, even Zimbabwe only experienced three of them. Under a bitcoin standard, they'd be regular events. Option B for preserving your relative position is to keep a sticker price of 10 per Toyota, but to update your shop's policy to indicate that your unit of account is BTCa, or old bitcoin, not new bitcoin. Old bitcoin is just an abstract concept, an idea. After all, with the split having been completed, bitcoins with BCH "baked in" do not actually exist anymore. But an implicit old bitcoin price can still be inferred from market exchange rates. When a customer wants to buy a Toyota, they will have to look up the exchange rate between BTCa and new bitcoin (i.e BTCb), and then offer to pay the correct amount of BTCb. To buy a Toyota that is priced at 10 BTCa, your customer will have to transfer you 10 new bitcoins plus the market value of ten BCH tokens (i.e. 1 bitcoin), for a total price of 11 bitcoins. This effectively synthesizes the amount you would have received pre-split. As the market price of Bitcoin Cash ebbs and flows, your BTCa sticker price stays constant—but your customer will have to pay you either more or less BTCb to settle the deal. So in Haiti, the nation's unit of account—the Haitian dollar—and its medium of exchange—the gourde—have effectively been separated from each other. (In my recent post on Dictionary Money, I spotlighted some other examples of this phenomenon.) An even better example of separation between medium and unit is medieval ghost money. According to John Munro (link below), a ghost money was a "once highly favoured coin of the past that no longer circulated." Because these ghost monies had an unchanging amount of gold in them, people preferred to set prices in them rather than new, and lighter, coins, even though the ghost coins had long since ceased to exist. Unlike option A, which would be characterized by a series of inflationary blips each time a split occurred, option B provides a relatively flat price level over time. After all, the old bitcoin price of goods and services stays constant through each split. However, as the series of chain splits grows, the calculation for determining the amount of new bitcoins inherent in an old bitcoin would get lengthier. In the example above, I showed how to calculate how many bitcoins to use after just one chain split. But after ten or eleven splits, that calculation gets downright cumbersome. Whether option A or B is adopted, or some mish-mash of the two, a bitcoin standard would be an awkward thing, the economy being thrown into an uproar every time a chain schism occurs as millions of economic actors madly reformat their sticker prices in order to preserve the real value of payments. If bitcoin is to take its place as money, it is likely that it will have to cede the vital unit of account function to good old non-splittable U.S. dollars, yen, and other central bank fiat units. The Bitcoin community is just too sectarian to be trusted with the task of ensuring that the ruler we all use for measuring prices stays more or less steady. P.S. : I've focusing on sticker prices here, I haven't even touched on contracts denominated in bitcoin units of account. For instance, if I pay 10 BTC per month in rent for my apartment, what do I owe after a split? Ten old bitcoins? Ten new bitcoins? Or would I have to transfer 10 new bitcoin along with 10 units of Bitcoin Cash? Who determines this? What about salaries? The problem of contracts isn't merely theoretical, it actually popped up in the recent split as some confusion emerged on how to deal with to bitcoin-denominated debts used to fund short sales. Matt Levine investigated this here. In a spinoff, you'd expect the original company's value to drop by roughly the value of the spun-off company, which after all it doesn't own any more. 5 BCH spun off from BTC on Tuesday afternoon, and briefly traded over $700 on Wednesday (though it later fell significantly). But BTC hasn't really lost any value since the spinoff, still trading at about $2,700. So just before the spinoff, if you had a bitcoin, you had a bitcoin worth about $2,700. Now, you have a BTC worth about $2,700, and also a BCH worth as much as $700. It's weird free money, if you owned bitcoins yesterday. **Say counterfeiters do manage to create a large amount of fakes. Even then this "fiat split" would have no effect on the value of genuine notes. Central bank are obligated to uphold the purchasing power of their note issue. They will filter out fakes be refusing to repurchase them with assets, the purchasing power of counterfeits quickly falling to zero, or at least to a large discount. When central banks are fooled by counterfeits they will use up their stock of assets as they erroneously repurchase fakes. But even then they will never lose the ability to uphold the value of banknotes as long as the government backs them up with transfers of tax revenues. Fiat chain splits only begin to have the same sort of effects as bitcoin chain splits when 1) counterfeiting goes unpunished; 2) the central bank can't tell the difference between which notes are genuine and which are fakes; and 3) it lacks the firepower and government support necessary to buy back paper money in sufficient quantity. Only at this point will counterfeiters succeed in driving the economy's price level higher. This, by the way, is what the Somali shilling looks like... a fiat currency constantly undergoing chain splits. *** I get my information on Haiti from this excellent paper by Frederico Neiburg. Why is a one pound coin worth more than four pennies? The UK's recently-introduced one pound coin is made of 8.75 grams of metal, 76% of that copper and the remaining 24% a combination of zinc and nickel. At market prices, this amount of metal is worth around four pennies. So why do pounds trade for 100 pennies? Why are Brits passing these coins around as tokens—i.e. far above their metal content—rather than at their intrinsic melt value of four pennies each? One answer is tradition. Brits accept that pound coins should trade at a 2000% premium to their metallic content because they've always done so. This isn't a very satisfactory answer. We need an explanation for why this tradition emerged in the first place. It could be that the British government simply says that coins must be worth more than their metallic content, and Brits have fallen in line with this order. If they pass on these tokens at an illegal price, they'll be fined, or thrown in prison, or forced to drink tea without crumpets. This too is an unsatisfactory explanation. Coin and banknote payments are highly decentralized—it's simply not possible to police against trades that deviate from the stipulated price. We have centuries of examples in which government proclamations about currency exchange rates have been ignored. Just today I can mention two. The Venezuelan government's official price for the bolivar is 2,870 to the dollar, but bolivars trade unofficially at 13,077, despite jail sentences to anyone caught trading in the black market. Zimbabwe's leaders say that their recently-printed issue of bond notes must trade at par to U.S. dollars, but in practice a 10-15% discount has emerged, one this will probably only widen over time. So if governments can't will a monetary instrument like a coin to trade at a premium, where do these premia come from? A bit of history about token coins—i.e. coins that carry a large premium—may help. One strange feature about the world before the 1800s is that everyone—you, me, and our grandmas—had access to the mint. We could walk into the mint with a bag full of raw gold or silver and ask the mint master to have this material coined. Upon leaving we'd be provided with the same weight of metal (less a small fee for the mint), except that it had been transformed into coin form. This was called free minting: access was available to everyone. Free minting meant that coins couldn't carry a premium over raw metal value, at least not for long. To see why, imagine a coin that contains one ounce of silver. When demand for that coin suddenly shoots up a shortage develops, the coin developing a 'fiat component'—it starts to trade at a large premium to its silver content, say one coin can buy two ounces of silver. At this point it has become a token. If I had one of these coins in my pocket, I'd sell it for two ounces of silver, take that silver to the mint, and get two coins in return. Voila, I've turned one coin into two coins! Because many people would conduct this same arbitrage, a slew of coins would enter into circulation. The shortage resolved, the market price of the coin would return to its intrinsic value. With the coin's fiat component gone, it has ceased to be a token. If coins to are exist permanently as tokens, free minting needs to be halted. If people can't bring in silver to be minted, there is no way for the public to draw out a new supply of coins to remedy a shortage. It is then possible for a coin's value to have a permanent fiat component, or, put differently, for the coin's market price to forever above the intrinsic value of its metal content. As an economy grows, people need more coins to conduct transactions. With the mints being shut to the public, how would this supply be created? The answer is that government itself must introduce new coins into circulation by purchasing metal, bringing it to the mint to be coined, and issuing the coins into the economy. If it puts too many coins into circulation, the artificial scarcity that feeds the fiat component of a coin's value will cease to exist and the price of these tokens will fall to their intrinsic melt value. By carefully regulating this supply, coins should always contain a fiat component—their token nature continuing in perpetuity. These were precisely the steps taken by the British authorities when they introduced their first official issue of silver token coins in 1817. In the centuries before, the British monetary authorities had always maintained a policy of free minting of silver, the Royal Mint—owned by the government—producing only full bodied silver coins, not mere tokens. In 1817, the era of free minting was suddenly brought to an end. The Mint would now only make new coins for the government's account, not for the public. 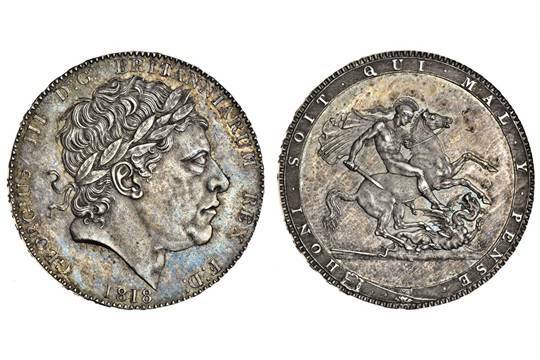 At the same time a token coinage was introduced, the silver content of the new coins being set such that it was now significantly below the coin's face, or par, value. The crown in the picture below, which has the legend of Saint George and the Dragon engraved on it, is an example of one of these early tokens. While this worked at first, over the next decade the mechanism for maintaining an artificial shortage—and thus the fiat component of the government's new tokens—broke down. From Redish, we learn that throughout the 1820s the new tokens began to accumulate at the Bank of England, still then a private bank, which had a policy of accepting tokens at their official value from the public, providing gold in return. (The Mint itself had no conversion policy.) The Bank had effectively become the only redemption agent for government tokens. Without the Bank's sopping up the public's unwanted supply at par, the market value of silver tokens would have quickly become unhinged from the coin's face value, eventually falling in price to the market value of their metal content. Having the Bank of England act as the lone redemption agent for the government's token coins wouldn't do, so in 1833 the government officially took on the task of maintaining the par value of tokens. The Bank of England still accepted all silver coins from the public at par, but now the Bank was allowed to return this stockpile to the Mint for redemption in gold at the coin's par value. And that, ladies and gentleman, is why your new pound coins, despite containing just 4 pennies in metal content, are worth a full pound. Since 1833 the British Treasury has promised to act as a backstop for all its token coinage, buying them back at their full face value so as to prevent any decline in the fiat component of its coins. 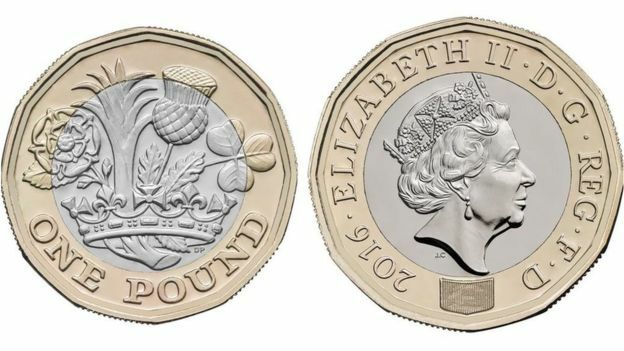 Put differently, your one pound coin is worth 2400% more then its metal content because the government promises to uphold that premium by using funds it has raised out of tax revenue. Coins are thus very much a liability or IOU of the government. This IOU nature of coins tends to operate far in the background, but it becomes much more apparent when a denomination of coins is cancelled. Take for instance the 2013 termination of the Canadian cent, in which the Royal Canadian Mint began to withdraw the lowly penny, the nickel being given the duty of serving as our nation's smallest denomination coin. Ever since then Canadians have been dutifully bringing their hoard of pennies into the local bank in return for cash or a credit to their bank accounts, banks in return sending the coins onward to the government for redemption. We know from its initial report that the government budgeted $53.3 million to pay the face value of pennies redeemed. Which means that it anticipated the return of 5.3 billion pennies. According to the Mint's 2016 Annual Report, some 6.3 billion pennies have been since brought in, a small amount compared to the roughly 35 billion produced since 1908 and presumably still languishing under mattresses and in dumps—but still above the budgeted amount. Which means a larger chunk of Canadian taxes will have to go to paying penny IOUs then originally expected. So as you can see, it isn't by mere diktat or tradition that coins trade above their metal content. It's the government's promise to buy them back that provides coins with their fiat component. In the case of the UK's new one pound tokens, should Her Majesty's Treasury refuse to backstop them its quite probably they'd be worth, say, just 90 pence a few years from now; 50 pence a decade hence; and finally 4-5 pence much further down the road. The market value of the pound coins wouldn't fall below that. At 2 or 3 pence per coin, Brits would start withdrawing them from circulation and illegally melting them down for their metal value. I also got inspiration from the conversation with Dinero and Antti on this post.